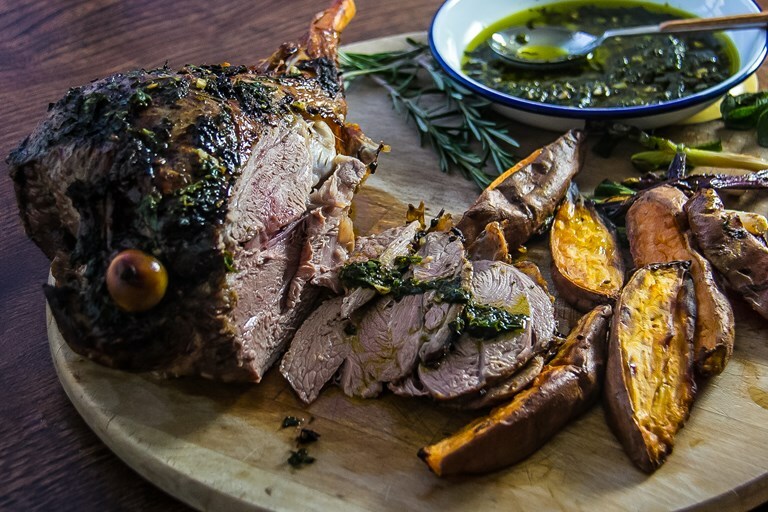 Rosana adapts a classic lamb al asador recipe into a dish that can easily be made at home in the oven, smothering heavenly leg of lamb in a punchy chimichurri before roasting. The chimichurri sauce is crucial to the dish, so taste regularly when making it to ensure the balance of flavours is right. The idea of preparing food over a fire in a field is such a thrilling and enticing one. There are a few ways to do it. In Argentina and Uruguay, asado is a traditional cooking technique that mirrors a barbecue, which involves cooking meat over a slow-burning fire. A whole animal carcass or piece of meat is prepared, skewered on a metal spit, placed very close to the open fire, and left to cook for hours. An asado, which is also the name of the event itself, again like 'a barbecue', usually features a parrilla, or open fire. The asador is the person who is in charge of the asado – in essence, the cook. The gauchos – people from the Pampas in Argentina, Uruguay, and Rio Grande do Sul (in Brazil) – developed a taste for meat cooked at an asado, which is roasted beef, lamb, or goat. Gauchos favoured cooking with local, low-smoking wood and not coal. Asado, accompanied by mate tea, formed the basis of the gaucho diet. In Argentina and Uruguay, the traditional dish cordero (lamb) al asador is served with chimichurri sauce and sweet potatoes. This recipe can be reproduced at home on a barbecue grill or in the oven. Turn the lamb halfway through cooking. Once cooked, remove from the tray and leave to rest covered with foil for 15–20 minutes.